Join the NSNT trekkers as they venture on an adventure of a lifetime throughout the midst of glaciers, granite towers, turquoise lakes and the vast grasslands of Patagonia. The rare and ecologically‐rich environment of Torres del Paine National Park is considered one of the premier treks in the world and represents one of the many breath‐taking places protected for its scenic beauty and ecological significance. 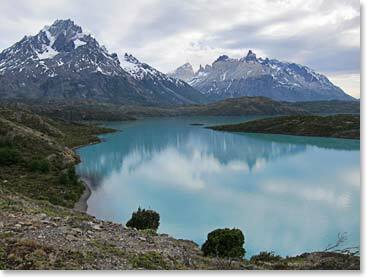 The Nature Trust’s goal is to facilitate a spectacular trek around the high peaks of Torres del Paine in the heart of Patagonia and raise critical funds for wilderness protection in Nova Scotia. Every dollar fundraised is a dollar towards saving natural habitat, old‐growth forests and pristine coastlines in Nova Scotia. The journey begins at the southern tip of the Americas in Punta Arenas, Chile, the historic port city where many of the early Antarctic expeditions began. Following our time in Punta Arenas, the team will travel north to Torres del Paine National Park and truly begin their adventure. We will set out to complete the famous “W Trek” alongside the iconic Paine Massif. Highlights of the circuit are countless, but some notable sights will include the massive Grey Glacier, the John Gardner Pass, the Valley of Silence and French Valley, and the countless towering peaks and turquoise lakes that will continuously surround us. Check back each day to read updates from the field! The Nature Trust is Nova Scotia’s leading land conservation charity, focused exclusively on protecting the province’s outstanding natural areas. Since 1994, the Nature Trust has worked together with landowners and local communities to protect the places they love. To date the Nature Trust has protected more than 7,000 acres, from unspoiled lakeshores, coastal wilderness and old growth forests to important wildlife habitat. February 5, 2013 – We’re Having a Hoot!